When Japanese musician Keigo Oyamada first began releasing music as Cornelius in the ’90s, his approach to art seemed ahead of its time. 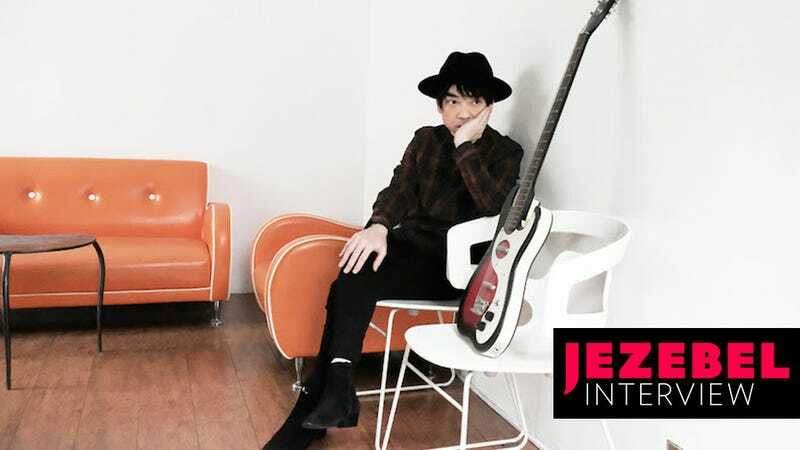 Formerly a member of the indie rock band Flippers Guitar, which riffed on the music of jangly ’80s British pop acts like Haircut One Hundred, Oyamada’s albums as Cornelius followed that vein until his explosive 1997 album Fantasma. That was when he reinvented his sound as a noisy sound collage of heavy guitar, spliced cartoon samples, and hyper, robotic vocals; a very Internet-inspired album before the Internet was even really a thing. Since then his futuristic electronic music has become a lot more relaxed, though no less weird. But Oyamada hasn’t released a new album as Cornelius in nearly 11 years, taking off time to produce other people, score an arty Japanese children’s show called Design Ah, and create the score to last year’s Ghost in the Shell, until 2017. Mellow Waves, his latest release out this week, might be the most minimalist thing he’s done: an airy, album that puts Oyamada’s vocals front and center and leaves plenty of space for reflection, particularly about one’s future. We spoke with Oyamada about the new album, with help from his translator. Interview has been lightly edited. JEZEBEL: This is your first album in 11 years. When did you know you wanted to put out another Cornelius record? Keigo Oyamada: I had actually finished this album earlier this year but during those years [of not making music as Cornelius] I was making music with Yellow Magic Orchestra, Yoko Ono, artists like Salyu and soundtracks like Ghost in the Shell. In Japan I also produce the music for this very popular kids show called Design Ah, so I’ve been busy making music on a daily basis with that. But for the last 10 years I’ve been writing songs for this record and it just kind of came together at the end of last year. When did you first start writing these songs? I actually started writing these songs in 2012 but I had so many projects and things going on a lot of the songs actually took a different direction and became something else. How did it feel to sing again and write lyrics on this record after years of only remixing or producing other people’s material? If you go back to the last two albums I’ve done, it was really a collage of words. I realized that I hadn’t been writing music for myself to sing in proper terms. That was something I was thinking about going into this and thinking it was something I needed to do, to sing my own songs for myself. What’s the concept behind Mellow Waves? Did you know what you wanted this album to sound like when you started making it? When I write songs or when I sit down to do a song I usually don’t have a concept that comes first. Instead I work on a lot of songs and then realize through working on them and listening to them certain moods will appear within them. They’re like common threads. Oftentimes those common threads are close to being called a concept. This time as I was working through the material I found a lot of the mood to be mellow and a term I’m calling waves, these waves of sounds. For most of my music sometimes these moods can dictate what happens with the music, like the last two albums a lot of it was words and there was almost coding behind these words. It was a very grid-oriented whereas this time there were more waves, like there was more improvisation or irregularities to it. There were more human characteristics to the music that made it feel, maybe, a little bit more emotional. As far as the grids go, I tend to think of these things as very logistic in my mind. I think of it as a grid where like this sound is here and this sound is there as opposed to this sound. It all uses sound and reason, somehow. But with improv there’s a whole different kind of logic behind it. I like that it’s spontaneous and it happens right then and there and it captures the moment and the emotion. It’s interesting to me to go from opposite sides of the spectrum, to combine these two elements. It was freeing in a sense, just having a new ability to express things. The emotion that comes through on this album for me is this sense of mellow-ness for me. You can take it a lot of different ways but for me getting older and learning more about life and really coming to grips with middle-age in a sense and this relaxed feeling that comes along with that. In what ways have you mellowed out as you’ve gotten older, outside of music? One thing I think about today is, and this isn’t necessarily me mellowing out, is that my kid is grown. My son’s now in high school and that’s been a big difference to me now. Especially because he works in a record shop and we sit around and talk about music and that’s been interesting. Then there’s the other things: eyesight starts to go, body starts to hurt. Are there any artists you’ve discovered through your son? Yeah, I get all the latest music from my son. Right now he’s gotten me into the band Mndsgn (pronounced Mind Design) and the band LISS from Copenhagen. What is the song on the record “Dear Future Person” about? This song is about a time where I’ve passed. I’m not in this world anymore. And the song is a letter to some friend that’s maybe reading it. It’s a song about not being there and people reading what you’ve left behind. They’re kind of ironic lyrics but I feel like if you’re someone that likes to buy records at a second-hand record shop you’d maybe understand the lyrics. And the lyrics are actually written by Shintaro Sakamoto who’s a member of the band Yura Yura Teikoku. And who is singing on “The Spell of a Vanishing Loveliness?” How did that collaboration come about? It’s sung by Miki [Berenyi] from a British band called Lush. She’s actually a distant cousin of mine. We actually discovered we were relatives about ten years ago, she’s my father’s cousin’s daughter. And my parents had been separated when I was a young kid so I didn’t really know about the distant relatives I had because of the family split-up. But ten years ago when my father passed away I realized she was my cousin and we got to know each other. I knew the band Lush to begin with so when they decided to get together last year I did a remix for them and in turn she’s on this song with me. You just toured your album Fantasma in full for its anniversary, which is a very noisy album, and so different from your current sound. How was the experience of performing that record again especially after creating an album that’s so tonally different? Last year when I toured that album I was in a totally different mode than anything to do with this record. I had a vague idea I wanted to release a new album but in terms of live performance it had been a full ten years. So at time wanting to finish the album was one thing but getting back to playing with the band was another. There had been some member changes so I decided to get back on stage for the first time in years. I wanted to practice some old songs, kind of revisit the past a bit, and reenact that time especially because it had been 20 years since the record came out. For me to be able to look back at Fantasma was a way to rehabilitate myself back into live performing. Intimate, unique sound design is very important to you as an artist. Even with touring Sensuous you were creating a very unique live experience. And I was wondering if you feel like in an increasingly more distracted world, with people listening to music on their phones, it’s become harder or more of a challenge to create an immersive world with music? There’s a lot of media right now that’s easy accessible and maybe people aren’t listening to things in their entirety but that immersive experience, I think, still exists in live performance. That will always stay that way. It’s a different side of a musical experience that can always be crafted a certain way and can be compressed in a certain way. So I feel like the live experience is still that place for an immersive experience within the changing climate of ways of consuming music. And along those lines I’d throw in that VR technology coming out right now is another real, incubating experience, and I’m working on a VR version of Mellow Waves right now.